Now The Details: On the Future of Journalism, the CBC as "Media Company" and a few other notions. On the Future of Journalism, the CBC as "Media Company" and a few other notions. The CBC's latest strategic plan is to move from being a broadcaster to a "media company". As the Corporation shifts from public broadcaster to public media company, and focuses on partnering to develop content, there are opportunities to reduce, rethink or eliminate aspects of the current infrastructure, such as reducing the technology footprint, reducing in‐house production, and rethinking bricks‐and‐mortar locations. This long‐term strategy will have a phased implementation. In principle, this appears to be a good idea. Eyeballs are moving on line and the media needs to anticipate that shift. 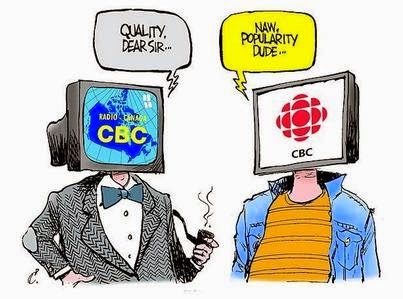 The problem is that the CBC, under its present mandate may not be legally able to do very much of that. Moving away from broadcasting to online has enormous implications. Not the least of which, is the fact that the Internet does not fall under the remit of the regulator, the CRTC. Sources tell me that the CRTC is upset by this move partly (or mostly) because the CBC would then cease to be a public broadcaster. For example, if the CBC in its new incarnation, still receives a Parliamentary appropriation, yet is not answerable to the regulator, to whom is this "public media company" accountable? Some observers expect that other broadcasters may attempt to stop this by claiming this to be a breach of the CBC's mandate. It could change the media landscape in which the CBC, even in its present wounded state, remains a formidable (and heavily subsidized) competitor to the commercial networks which are also on increasingly shaky financial ground. A few months ago, the troubles of the CBC - already apparent - became grist for an interview mill with me by Jesse Brown. Jesse is the producer of a blog and podcast called "Canadaland". He invited me to meet with him in his studio in downtown Toronto to talk about the state of the media, the role of journalism, journalism schools and of course, the CBC. This interview took place as the CBC began to salvage something from the wreckage left behind after losing the rights to broadcast hockey on CBC TV. The CBC had just announced that more than 600 employees were being laid off and schedules were in flux. So there was a lot to talk about. Jesse and I spoke for more than an hour, and the edited version is here.